The visit is part of the 19-year-old’s first Royal tour with her father at the start of her gap year. The Princess met survivors and aid workers in Sichuan province, where 70,000 people were killed in May, before visiting the school and placing a bouquet at the spot where hundreds died. 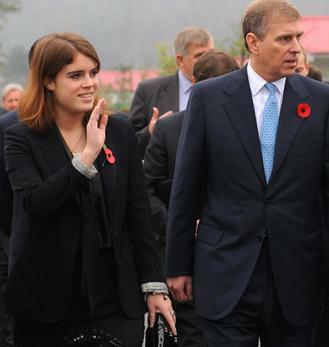 Prince Andrew, Duke of York and his daughter Princess Eugenie visit the debris to dedicate flowers to the deceased of the “Sichuan’s May 12 earthquake” on November 4, 2008 in Dujiangyan, one of the worst earthquake-hit area of Sichuan Province, China. Princess Eugenie has said she wants to be a “hands-on” Royal, doing “more than ribbon-cutting”. She previously went to Turkey with her mother Sarah Ferguson, who is also known as Duchess of York, and the young princess wept at the sight of so many abandoned children living in appalling conditions.